1. 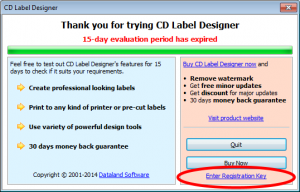 If you haven’t already, you need to download and install trial version of CD Label Designer. 2. 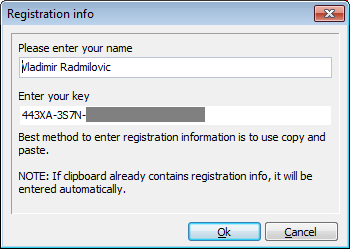 Copy to clipboard your registration name and key from the notification email you received after the purchase. It will also work if you copy the whole message. 3. Run CD Label Designer. When you see this window, click “Enter registration key” option. 4. If registration name and key are found in clipboard (step 2), it will be automatically filled in for you. You can also enter registration name and key manually. 5. Click “Ok” and you should see confirmation message. This entry was posted in Uncategorized on November 25, 2014 by vradmilovic. In case you missed the link from the home page, there’s a short video on Youtube (just 2 and a half minutes long) that shows how you can use CD Label Designer to easily and quickly create nice looking label for your home-made disk. The video teaches you to insert photo, circled text and formatted text, change font and other formatting and apply some interesting effects (shadow and transparency). But this is not all that CD Label Designer supports – you can design other types of labels (CD/DVD covers, Booklet or Sleeve/Envelope), apply even more photo effects, add various shapes with different fill types, automatically insert list of files or songs, etc. Feel free to learn more, download a trial and play with it a bit. This entry was posted in Uncategorized and tagged cd label, design, software on September 18, 2014 by vradmilovic. 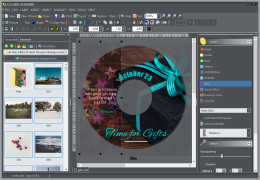 CD Label Designer version 5.3 is ready for download. This update contains several improvements and fixes and it’s free for all v5.x customers. This entry was posted in Uncategorized on February 26, 2014 by vradmilovic. This CD Label Designer update contains some improvements and fixes. Another slightly important update is in Print window: in addition to printer output tray, now you can also change media type without opening standard driver’s Printer Properties, which can be easily missed. This update is free for all v5.x customers. Starting with version 5.2, a free version is also available. It’s a “little brother” of full version and it doesn’t contain all the bells and whistles, but it’s still arguably most advanced labeling software available on the market, especially among freeware. This entry was posted in Uncategorized on September 11, 2013 by vradmilovic. This CD Label Designer update contains number of improvements and fixes. One of most important is the memory usage optimization, so performance while editing labels with very high quality images is significantly improved. This entry was posted in Uncategorized on June 26, 2013 by vradmilovic. We have just uploaded updated German translation (thank you Peter!). As a reminder, if you wish to help translating CD Label Designer to your own language, we will send you a free license. Just contact us for further instructions. This entry was posted in Uncategorized on February 11, 2013 by vradmilovic. Today we have released a minor update with French and Polish translations updated – thank you David and Maciej! We are still waiting for someone who’s willing to update German and Italian, or at least start working on any other currently unsupported language (such are Spanish, Portuguese, Dutch, …). In addition, we have fixed few bugs in the translation part and in Get From Print Layout option. This entry was posted in Uncategorized on January 9, 2013 by vradmilovic. This entry was posted in Uncategorized on November 23, 2012 by vradmilovic. All current customers of any of our software (including Agenda At Once and Web Log Storming) can buy an upgrade for 50% of the full price. No. Scratch that. To reward quickest of you, in next several days price will be even lower: a discount of 67% brings an upgrade price down to the unbelievable $9.98 for Personal and to $13.32 for Business edition. It’s really a no-brainer now, so hurry up before this early-bird offer expires and we set the price back to 50% ($14.97 / $19.97)! 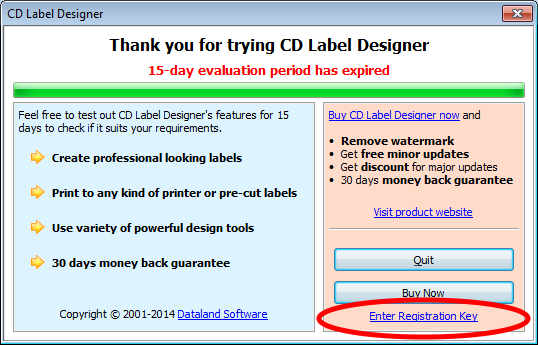 Note that, if you bought CD Label Designer after September 1st, 2009, you get an upgrade for free. To take an advantage of this offer, just type your original registration key into Promotional code field in the order form (see instructions here), or contact us if you have any problems. Well, if you purchased after Sep 1st, you already qualify for free upgrade. If not, there are still other possibilities. The new one on the list is the opportunity to send us print layout that you use, if it’s not already included in the default installation. Just use print layout export option to send us .XML file and we’ll send you a free key. This entry was posted in Uncategorized and tagged cd, cover, creator, designer, dvd, label, maker on December 2, 2009 by vradmilovic. If you are in hurry, read at least last paragraph of this post. Because of serious amount of spam messages circling around on the global net, e-mail servers and spam filters become more and more rigorous during the time. This could really be a problem as legitimate e-mails often don’t get through. There are also other reasons for similar problems (for example, typo in the e-mail address), but this one is most probable. It’s a really unpleasant situation for us: time after time we receive angry e-mails from our customers because they feel that we are ignoring their support requests, which is quite understandable and justified. In some cases we are forced to reply with several different options (SMTP servers) hoping that at least one of them will succeed, but if any of users don’t confirm the reception, there’s a living suspicion in the back of our minds. So, here’s a firm statement: We don’t leave any of support requests unanswered intentionally. Yes, sometimes, if problem cannot be easily resolved, it could take some time, but even then we will send a notification that you have been heard and that we will get back to you eventually. Is there really a solution? Although not perfect, best bet would be to use our Support Ticket System instead of simple e-mail. In this case, you can be sure that we will get the message, and, what’s more important, there would be an always accessible web copy of the conversation. IMPORTANT: When you submit a ticket, you should receive an e-mail informing you about it, among with direct web link to this copy. If you don’t receive this e-mail in few minutes, that’s a good signal that something is wrong, probably in server-server relation. In this case, please save direct link presented in the web browser after submitting ticket, so you can use it later to check if your request has been answered. This entry was posted in Uncategorized on May 29, 2008 by vradmilovic.